Kay has been in full-time real estate since 1976. She is certified competent in many areas of real estate. She is known for commitment to working early and late with have a very hands-on management style. She remains “first phone” on every transaction, and her market area is comfortably Ventura County. She is a Certified Probate Real Estate Specialist, a Seniors Real Estate Specialist and a member of the American Association of Senior Moves. 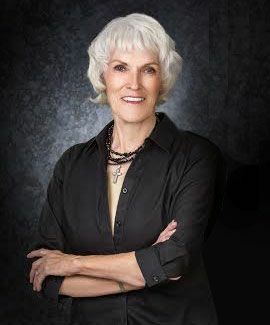 She served as Mayor for the City of Santa Paula; named REALTOR® of the Year for the Ventura Association of REALTORS® in 1996 and was selected as the Most Distinguished Alumnus for Cal Poly Pomona. In her volunteer life, she serves as Chaplain to the Ventura County Fire Department. She also serves as the volunteer director of homeless services in the region. She and her husband Howard Bolton live simply in the City of Santa Paula with three rescued boy poodles, two rescued cats, and they finally have their girl! She was an abused puppy whose new name is “Goodie”. One of the cats is named Scout and she lives at the real estate office.